Look what I found in a gift basket, sent from a vendor, to our office. Unlike most gift-basket food, which is highly suspect, and tastes about as good as the actual basket, these are good. These are bigger than raisinettes, and the chocolate is creamier. 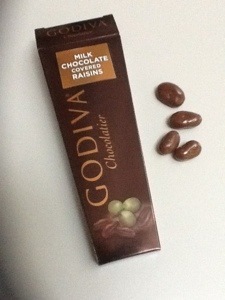 Chocolate covered raisins are a stealth candy. They rarely make a “favorites” list, but they are remarkably good. If you spy these in a gift basket, grab them. Posted in chewy candy, Milk chocolate and tagged gift basket food. Bookmark the permalink.